Evident Security Platform (ESP) captures over 10 billion AWS cloud events each month. These events affect organizations of all types- from large to small, to seasoned and beginner cloud AWS users. Using our risk engine, we analyze, prioritize, and categorize these events to discover what is going unchecked. 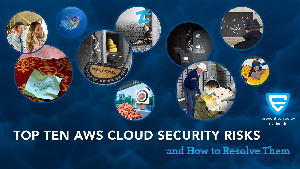 The ebook “Top 10 AWS Security Risks,” explores the most common security mistakes that users make and discusses how to remediate these threats.